A new technology platform to study high-speed impacts on a tabletop has been developed at the University of Illinois. This method uses a laser to launch thin metal foils at km/s velocities. 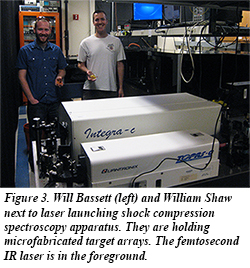 Although “laser-launched flyer plates” have been studied for more than 30 years, they have not been broadly utilized in shock compression science, partly due to the cumbersome schemes previously employed, and partly due to concerns about the ability of these thin flyers to produce well-characterized planar shocks in materials that are of the quality needed to compete with gun shock generators. Under the mentorship of CDAC Partner Dana Dlott and UIUC scientist Alexandr Banishev, CDAC Students William Shaw and Will Bassett developed a simplified method for launching flyer plates and characterized the properties of flyers composed of different metal foils with different thicknesses launched at speeds up to 6 km/s. They interfaced a powerful femtosecond laser with the flyer launcher and used this apparatus to make stroboscopic images of the flyers during launch, in flight and during impacts with target windows (Fig. 1). 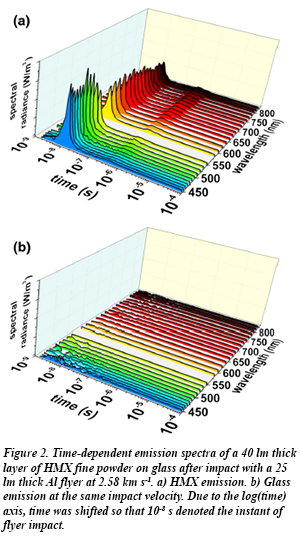 Combining the ultrafast microscope with high-speed photon Doppler velocimetry, they showed that the flyers make uniform, flat impacts with glass targets, and that the tilt of the flyer can be 1 mrad or better. These are qualities found only in the highest performance gas gun systems and laser facilities. 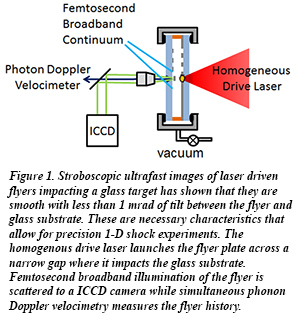 Coupling laser-driven flyer plates to ultra-high speed spectroscopic diagnostics has been a challenge due to variability in the timing of the flyer impacts. The Illinois group did a statistical analysis of hundreds of flyer launches, and they demonstrated that the variations in velocity could be as small as 0.5% and the variations in target impact time could be less than 1 nanosecond. These measurements establish the tabletop laser flyer technique as a proven method to study high-speed planar impacts (Fig. 2) [A. Banishev et al., J. Dynamic Behavior Mater., DOI:10.1007/s-40870-016-0058-2 (2016)].